Solid wood bed frame complete with a mission style 3" wide slat headboard, made with a natural wood finish. Just the thing to complete your Organic Bedroom Makeover. Oftentimes, conventional beds use laminated slats to support the mattress. The lamination used to seal the wood can contain harmful toxic chemicals. Our slats are made with poplar wood and never treated with a laminate. Each wooden slat is 3" apart from the next slat. Natural rubber mattresses require a maximum 2.75" space between each supporting wood slat to properly support it- we advise you purchase an extra set of poplar sets if you sleep on a natural rubber mattress. 'Treated' - i.e., to finish the wood, we use Tried and True Danish Oil. Odour - since Tried and True Danish Oil is made from linseed oil (derived from the seeds of the flax plant), there will be a slight odour that will dissipate quickly. The Regular height of the bed frame (from the ground to the base of the slats) is 11.5" and the headboard (ground to the top of the headboard) is 35"
No glue ledgers are used to assemble our beds. The pieces are fastened using metal hardware in place of toxic glues or chemical fasteners. These four elements come together to form a superior bed frame - ideal for those with chemical sensitivities to toxic glues, laminates and finishes often found in conventional bed frames. Superior form, superior function, superior strength. If you are looking for a more distinctive footboard (such as what is shown here), simply indicate that you would like a matching footboard. This adds an extra crosspiece, as well as an extra 7" in height, to any standard footboard. The footboard and headboard will match in appearance. 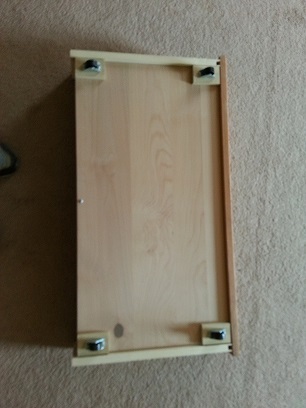 Need under the bed storage space? Consider adding a separately attached set of drawers. 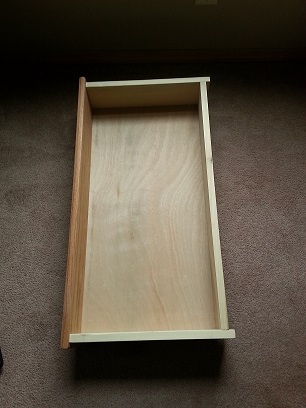 These drawers have a maple/oak front, sides, and a poplar backing. They have rollers for easy access from under the beds. Great for kids bedrooms! Two in a set.